A false-color composite image of a "glory" seen on Venus July 24, 2011. The picture combines ultraviolet, visible and near-infrared wavelength images from the Venus Monitoring Camera aboard ESA's Venus Express. The glory was about 1,200 kilometers (746 miles) across. 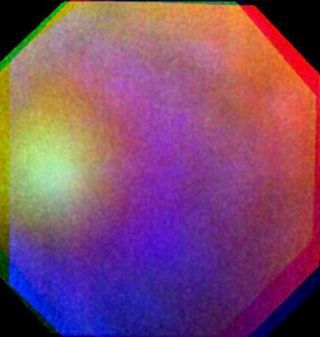 Scientists have captured shimmering rainbow colors above Venus for the first time using a European spacecraft currently orbiting the cloud-covered planet. The new Venus photos mark the first time that a rainbow-like "glory" has been photographed on another world besides the Earth, officials with the European Space Agency (ESA) announced this month. The phenomenon also pointed to a mystery in the hothouse planet's atmosphere, they added. ESA's Venus Express spacecraft captured a 746-mile (1,200 kilometer) glory on Feb. 24, 2011 that happened when the sun shone on sulfuric acid droplets atop the atmosphere. The phenomenon was spotted about 43 miles (70 kilometers) above Venus' surface after researchers took pictures of the clouds with the sun directly behind the spacecraft. Glories and rainbows both arise from reflected sunlight, but behave differently. Rainbows arch across vast distances, while glories are more concentrated and have colored rings converging on a shiny center. Three images of a glory spotted on Venus July 24, 2011. From left, ultraviolet, visible and near-infrared images from the Venus Monitoring Camera aboard ESA's Venus Express. The glory was about 1,200 kilometers (746 miles) across. "Glories are only seen when the observer is situated directly between the sun and the cloud particles that are reflecting sunlight," ESA officials wrote in a statement. "On Earth, they are often seen from airplanes, surrounding the shadow of the aircraft on the clouds below, or around the shadow of climbers atop misty mountain peaks." Venus (left) and Earth (right), not taking into account changes due to haze or background cloud. Glories happen when sunlight shines on cloud droplets. The difference seen between the two planets is mainly due to the tiny droplets found on Venus – just 2 thousandths of a millimetre across – compared to 10 thousandths to 40 thousandths of a millimetre on Earth. Conditions for glories best occur among spherical cloud particles (implying they are liquid droplets) that are about the same size. On Earth, glories occur with water droplets, which are about 10 thousandths to 40 thousandths of a millimeter across. The sulfuric acid droplets high in Venus' atmosphere are much smaller — just 2 thousandths of a millimeter across — making the rings tighter from an observer's perspective than on Earth. What surprised researchers was how variable the brightness was within the rings. Scientists believe there must be more than sulfuric acid and water droplets in Venus' atmosphere. "One idea is that the cause is the 'UV-absorber', an unknown atmospheric component responsible for mysterious dark markings seen in the cloud tops of Venus at ultraviolet wavelengths," ESA officials explained. "More investigation is needed to draw a firm conclusion." The research was published in the Feb. 13 edition of Icarus. It was led by Wojtek Markiewicz of the Max Planck Institute for Solar System Research in Germany.